To discover this god particle, scientists have had to build what is called the Large Hadron Collider (LHC), which is estimated to have costs £6.6 billion (N1.65 trillion). The LHC works by smashing protons, particles found inside atoms, to produce temperatures as high as four trillion Celsius, 250,000 times hotter that the centre of the Sun. The collision of the protons produces debris, which was then examined for the Higgs Boson particle. So on 4th. 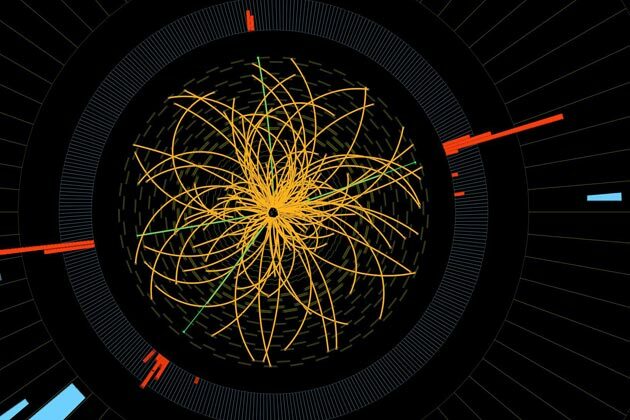 of July, why Americans were preparing to celebrate their independence, Scientists came out with the historic announcement that they have found the “God Particle” 50 years after Peter Higgs, a professor at Edinburgh University first proposed the existence of the particle. Interestingly, he was there to listen to the announcement. Finding the Higgs boson proves the existence of the Higgs Field, a force which provides fundamental particles - the building blocks of the Universe - with their mass. Without mass they would simply zip around the cosmos at the speed of light and never form into stars and planets. It is also the last missing cornerstone of the Standard Model of Physics, which explains what the Universe is composed of, according to the Telegraph. Professor John Womersley, chief executive of the Science and technology Facilities Council, told reporters at a briefing in London: "They have discovered a particle consistent with the Higgs boson. “Discovery is the important word. That is confirmed. It's a momentous day for science." Science discoveries usually make the news in the Western media. But the announcement of the discovery of the Higgs Boson had a celebrity touch. Perhaps, this is due to the huge amount involved in the experiment leading to the discovery and also the significance of the discovery. Interestingly, Scientists are still very unclear about the practical implications of the discovery of the Higgs Boson particle. The Telegraph quotes Higgs as saying “It’s around for a very short time. “It’s probably about a millionth of a millionth of a millionth of a millionth of a second. I don’t know how you apply that to anything useful. But the Telegraph quotes Alan Walker, a colleague from the Edinburgh University School of physics and astronomy, as saying there had been the same uncertainty when the electron was discovered. So it may just be a matter of time before the discovery of the God Particle leads to new practical applications that change the way we live. The news that made dominated the headlines in Nigeria; the same week the discovery of the Higgs Boson was being announced in London was the $3 million bribery scandal involving Nigeria’s House of Representatives. This news fought for front page attention with the usual news about the campaign of bombing being carried out in Northern Nigeria by the Boko Haram anarchists. Less prominent was the news about the dwindling interest in Science by Nigerian students as reported by the Nigerian Guardian in a short story July 8, 2012. This story reported the lamentation by the Vice Chancellor of the Nnamdi Azikiwe University in Eastern Nigeria. The VC disclosed shockingly that of the 52,000 candidates that applied to the University for Admission, only 76 candidates offered to read Mathematics. Also more than half of the 52,000 applicants offered to read courses in the Arts and Humanities. Most likely, a good proportion of the remainder; will offer to read courses in the Business and Social Sciences leaving just a small fraction to read the sciences. The pattern of student preferences is not surprising. Most students are responding to expected job market demands. We all know who gets the high paying jobs after University. Besides, it is also a factor of how well students feel prepared to tackle the challenges of studying science at the University. We all know most public secondary schools science labs are poorly equipped. It is not much different at the University level. A survey among secondary school students in Nigeria may show that surprisingly a large proportion would have loved to read the sciences. So the obvious challenge is the lack of institutional encouragement and poor post study demand for those who read sciences in Nigeria. The marketing departments of most banks have a significant representation of graduates who made first class and second class uppers in sciences. For lack of good jobs that can give them living wages in their preferred fields, they now hawk financial services on the streets, a vocation that demands little intelligence. There is the challenge of poor funding for public education and the reluctance and inability of parents to also pay higher fees for higher quality education. Quality education is expensive, a reality both the government and Nigerians are yet to accept. This does not necessarily mean that higher cost education is equal to higher quality education but good quality education is definitely not cheap. Well equipped laboratories are expensive. Quality teachers and lecturers will not accept non living wages. There are also lack of incentives to encourage science education. There are no scholarships and government backed student loans are also non existent. It is not also clear how research activities in Nigerian public universities are linked to their public funding. How well linked is the promotion of lecturers to their achievements in research? The media also needs to play a critical role. What prominence does the Nigerian media give to scientific achievements in our universities? The media is quick to report sexual harassment, cultism and the politics of appointing vice chancellors in Nigerian universities. How well does the media give equal coverage to scientific discoveries in the universities? Does Nigeria need science education? Most definitely. Sciences of the God Particle may sound farfetched for the daily struggles of the average Nigerian. The science of the Western world has moved to space exploration, but Nigeria still need the science that helps it conquer high levels of poverty. For example, there are still many tropical diseases that western drugs have no precise answers yet or have overly expensive remedies. The immediate question is how do change the culture of consumer worship to the worship of knowledge and understanding? We may not need to discover another God Particle; but we need to discover the science to conquer our immediate challenges. For example, how well do we understand the science of Nigerian corruption?